If you don't have a gmail account feel free to use this guest account to chat. Thanks for watching this weeks Musical Livestream and being part of the worlds first interactive music project! If you've missed previous sessions or leave partway through this Livestream, they will all be archived and available for you to watch at any future time for your convenience. 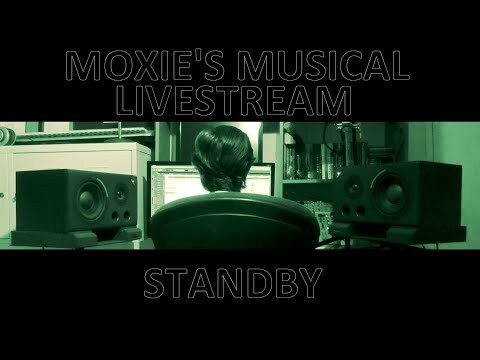 Just go to http://www.Patreon.com/MoxieKitchener to find previous streams. Thanks for watching and hopefully you will continue to enjoy these weekly streams. Quick Question: "So do I (the audience) get any royalties/money if you use some of my lyrical suggestions or titles?" Answer: Generally no but potentially yes. If you suggest enough lyrics and words (50%) for a song that end up being used in the final version, then your name will be added as a co-writer of that song and will be entitled to possible future royalties/money if it's used on the final album. An amazing acoustic guitar, electric bass, and pan drum instrument. AGM Lite II, ABP Lite II, Ample Percussion Cloudrum.